Mark A. Nordenberg joined the faculty of the University of Pittsburgh School of Law in 1977. He quickly built a reputation as an outstanding teacher, and was the initial recipient of the School’s Excellence in Teaching Award and one of the first faculty members to receive the University-wide Chancellor's Distinguished Teaching Award. His area of academic specialty is civil litigation, and he has served as a member of both the U.S. Advisory Committee on Civil Rules and the Pennsylvania Supreme Court's Civil Procedural Rules Committee. He holds the special faculty rank of Distinguished Service Professor of Law. Early in his career, Nordenberg served the University as Dean of the School of Law and as Interim Provost of the University. 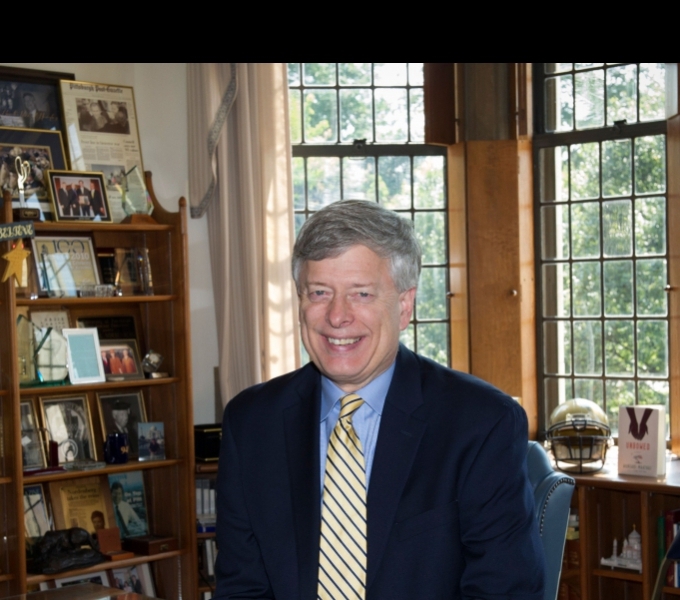 In 1995, he was elected Interim Chancellor by the University's Board of Trustees, and in 1996, following a national search, he was elected Chancellor. He served in that role until 2014, and under his leadership, the University achieved new levels of quality and impact on virtually every front. Undergraduate applications and the academic credentials of enrolled students soared; faculty and students regularly received the highest forms of national and international recognition; Pitt consistently ranked among the top U.S. universities in federal research awards; and the University successfully completed a $2 billion capital campaign. Chancellor Emeritus Nordenberg has received many important honors. Among them, he has been named Pittsburgh’s Person of the Year by Pittsburgh Magazine and a History Maker by the Senator John Heinz History Center. To celebrate the remarkable progress achieved during his first decade as Chancellor, trustees, alumni leaders and other friends contributed $2.5 million to endow a chair in his name. In 2012, he was again honored when the Pitt Board of Trustees announced the naming of the Mark A. Nordenberg residence hall and the creation of an endowed scholarship fund, already supported by more than $5 million in private donations, also bearing his name. Nordenberg is a past Chair of both the Pittsburgh Council on Higher Education and the Pennsylvania Association of Colleges and Universities and served on the executive committee of the Association of American Universities. He is a member of the boards of directors of BNY Mellon, UPMC and the Manchester-Bidwell Corporation. Nordenberg is an honors graduate of North Allegheny High School, Thiel College and the University of Wisconsin Law School. Reflecting his role as a leader in higher education, he has been awarded honorary degrees by Carnegie Mellon University, the Community College of Allegheny County, Duquesne University, LaRoche College and Thiel College, as well as the University of Pittsburgh. Chancellor Emeritus Nordenberg now serves as Chair of the University’s Institute of Politics. For nearly thirty years, the Institute has provided a non-partisan forum for the consideration of policy issues of importance to the region by elected officials and other civic leaders. Among other topics, recent initiatives have addressed the changing face of poverty, the opioid addiction epidemic, incarceration policies and practices, and the plight of financially distressed municipalities.